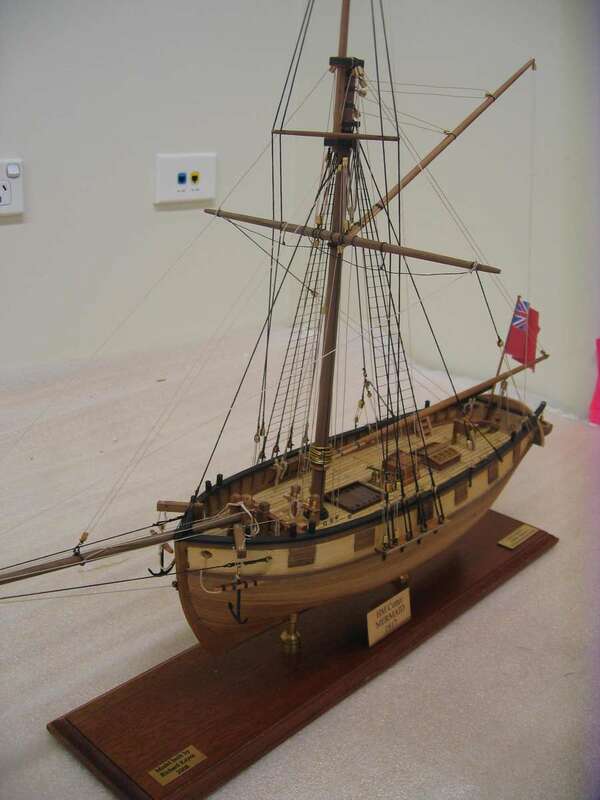 One of the museum’s volunteer model makers recently donated to the museum a scale model of an early colonial Australian ship that saw many adventures in its comparatively short but very well traveled life. HMS Mermaid was a single masted, copper-sheathed, iron-fastened cutter of 84 tons. It was a small vessel at just 18 metres, but was to undertake several important survey voyages around the remote Australian north and western coastlines between 1817 and 1820. The passengers and crew aboard the Mermaid were an interesting array of early colonial figures that included inland explorers, botanists and artists, as well as an Aboriginal man from Broken Bay. The first prominent person associated with the ship is Phillip Parker King (1791 – 1856), son of the Governor of NSW between 1800-1806, Philip Gidley King. Phillip Parker King was to become one of Australia’s greatest maritime surveyors. He had entered the Royal Navy in England in 1807, and was promoted to lieutenant in 1814. In 1817 he was assigned to survey the parts of the Australian coast that had not previously been examined by Matthew Flinders. The Admiralty instructed King to discover whether there was any river ‘likely to lead to an interior navigation into this great continent’. The Colonial Office had also given instructions to collect information about topography, fauna, timber, minerals, climate, as well as ‘information on the natives and the prospects of developing trade with them’. After arriving in the colony, King made four voyages between December 1817 and April 1822. The first three were in the Mermaid which had been purchased by the Royal Navy for his surveying expeditions. Among the 19-man crew were the botanist Allan Cunningham and Bungaree, an Aboriginal man from the Broken Bay area. Bungaree had come to prominence in 1798, when he accompanied Matthew Flinders on a coastal survey as an interpreter, guide and negotiator with local Indigenous people. He also accompanied Flinders on his circumnavigation of Australia between 1801 and 1803. Flinders noted that Bungaree was ‘a worthy and brave fellow’ who, on more than one occasion, saved the expedition. After his survey and exploration expeditions, the well traveled and respected Bungaree remained a prominent Aboriginal person in Sydney society for many years. The Mermaid was built of Indian teak in Calcutta in 1816 and after a re-fit for the expedition, sailed from Port Jackson on the 21st of December 1817, surveying Twofold Bay, King George Sound and Exmouth Gulf. From Port Walcott the survey party went to the north coast of Arnhem Land and explored it westward from Goulburn Island and the King River, around the Cobourg Peninsula and into Van Diemen’s Gulf as far as the West Alligator River. The Mermaid then visited Melville and Bathurst Islands, called at Timor and the Montebello Islands, and returned to Sydney Cove on 29 July 1818. During this voyage the botanist Cunningham collected over 300 specimens, including several species from Arnhem Land that were new to the Europeans. The crew had many encounters with Aboriginal people and Malaysian fishermen. In December 1818 and January 1819 King surveyed the recently discovered Macquarie Harbour in Van Diemen’s Land and sailed in May for Torres Strait. King took the explorer John Oxley as far as the Hastings River, and continued on to survey the coast between Cape Wessel and Admiralty Gulf. The Mermaid returned to Sydney on 12 January 1820. The vessel had proven to be a most capable coastal survey ship and began a third voyage of exploration in July 1820, with Cunningham the botanist again on board. It was King’s intention to proceed with all speed along the east coast as before, to the north-west coast. However on the 20th July, while standing in at Port Bowen on the north-eastern coast, the Mermaid ‘took the ground’ and remained fast. With great effort by the crew, the ship was warped off into deeper water, where it was found that ‘she had received considerable injury’. The ship was repaired and continued the voyage, however after constantly taking in water, King decided to return to Sydney. In a dramatic scene – immortalised in a painting by Conrad Martens – the leaky Mermaid was caught in a storm just short of Sydney, and after hitting a rock, limped in to the safety of Botany Bay, rounding Banks Headland during flashes of lightning. On King’s next voyage to the ‘unknown north west coast’ in 1821, he was forced to use a new ship, the Bathurst. Yet the battered and bruised Mermaid lived on, and was taken over by the colonial government and re-fitted for John Oxley’s surveys of Moreton Bay, Brisbane and the Tweed Rivers. It was later used to supply penal colonies at Port Macquarie, Norfolk Island and Moreton Bay, and made voyages to Van Dieman’s Land, New Zealand, and even Tahiti and Hawaii. In 1829 the hard worked Mermaid was converted into an armed, two-masted schooner. Under Captain Samuel Nolbrow, it was en route to Port Raffles on the northern coast and then Albany in Western Australia, when Nolbrow decided to risk the inshore route through the Great Barrier Reef. The Mermaid’s interesting career soon ended on a coral reef. The wreck was re-discovered by an underwater archaeology team led by the Australian National Maritime Museum in early 2009. The model was donated to the museum at the exciting time of the discovery of the wreck and is a testament to the well traveled and hard worked cutter, as well as the fascinating people associated with the Mermaid.